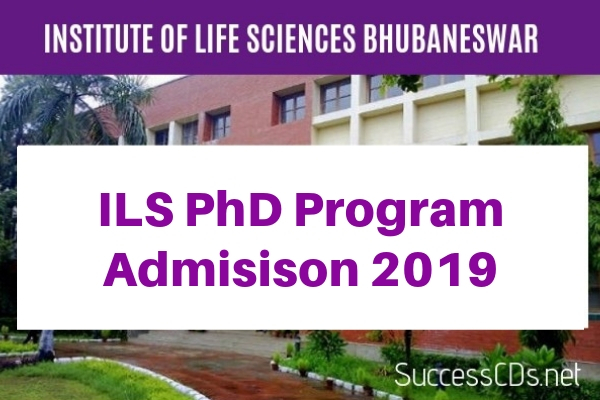 Institute of Life Sciences PhD in Biotechnology Admission 2019 -Institute of Life Sciences (ILS), Bhubaneswar, an autonomous Institute of the Department of Biotechnology, Ministry of Science & Technology, Government of India engaged in advanced research invites applications from Indian nationals for PhD Programs for the academic year 2019-20. Note: The name of the faculties who are interested in taking students through regular PhD Program of ILS or through their extra mural projects are listed under the respective research areas. Candidates should have passed their M.Sc./ M.Tech./ M.Pharm./ M.V.Sc. or equivalent qualification in life sciences and allied subjects (Biochemistry/ Biotechnology/ Bioinformatics/ Biophysics/ Chemistry/ Microbiology, etc.) with minimum of 60% marks (or equivalent grade point). Programming/scripting experience would be a plus for candidates interested in Bioinformatics. Candidates awaiting final results may also apply, however, if shortlisted, they have to produce their final mark sheet on the date of the interview, failing which they will not be interviewed. Interested and eligible candidates may fill-up the prescribed application form as available in ILS Website www.ils.res.in. Application to ILS-PhD Program does not automatically guarantee that a candidate will be shortlisted for interview. Director, ILS reserves the right to withdraw the procedure without assigning any reasons thereof.